The 2016 Rio Olympics in Rio Di Janeiro put Brazil on the world stage as a country with more to offer than soccer and sunshine. The Olympics made it clear that Brazil is a country bustling with opportunities for both commercial and personal interests. This is why dozens of Canadian businesses and individuals choose Brazil as their next destination every year for a multitude of reasons. Whatever your intentions are in Brazil, if you have any Canadian documents that need to be used in Brazil you will have to go through a process which will make them valid in Brazil. These include documents such as birth certificates, marriage certificates, power of attorney, divorce certificate, certificate of incorporation, certificate of pharmaceutical product, authorization letter, and board resolution. Documents issued in foreign countries cannot be simply accepted elsewhere; they must go through a process which ensures that the documents are legitimate. You may have heard of the apostille process used by Brazil and over 100 countries around the world and perhaps you have been told to get an apostille in Canada for Brazil. What you may not have heard is that Canada has not signed the Hague apostille convention and therefore there is no apostille process in Canada. Instead, Canada uses the original process of authentication and legalization. This is equivalent to the apostille and is recognized as being equal to an apostille in Brazil and almost every other country in the world. The two step process of authentication and legalization begins with authentication at Global Affairs Canada here in Ottawa. Before authenticating your Canadian documents, Global Affairs Canada has a series of requirements that need to be met. These vary from document to document as some contain signatures that are recognized by Global Affairs Canada whereas others require notarization by a lawyer or notary public; signatures which are also recognized. Once your document has been authenticated, then it is ready for legalization at a Brazilian consulate. Brazil has consulates in Ottawa, Toronto, Vancouver, and Montreal. Like some other countries, the appropriate consulate where your authenticated documents will need to go will depend on where they were issued. However, not all Brazilian consulates accept documents which have been authenticated by Global Affairs Canada. Some require provincial authentication such as ODS authentication or Alberta Justice Department authentication. Each consulate also has its own additional requirements and processing times which are subject to change. This makes legalizing your Canadian document for use in Brazil incredibly complicated and time consuming. Coupled with the potential 20 business day processing time at Global Affairs Canada, authentication and legalization of your Canadian document for use in Brazil can take a very long time. In a fast-paced world where there are important deadlines to meet, this long waiting period is not an option. This is why our service exists, and why thousands of Canadians choose us every year to help them with their affairs in Brazil. We have helped Canadians with their foreign affairs for over 25 years. From birth certificates, marriage certificates, power of attorney, corporate resolutions, certificate of incorporation, articles of incorporation, and CPP, we are experts in countless Canadian documents for use in over 100 countries. Each year we help thousands of Canadians, from engineering companies, law firms, pharmaceutical companies to professional individuals, famous actors and famous musicians with their Canadian documents for use abroad. 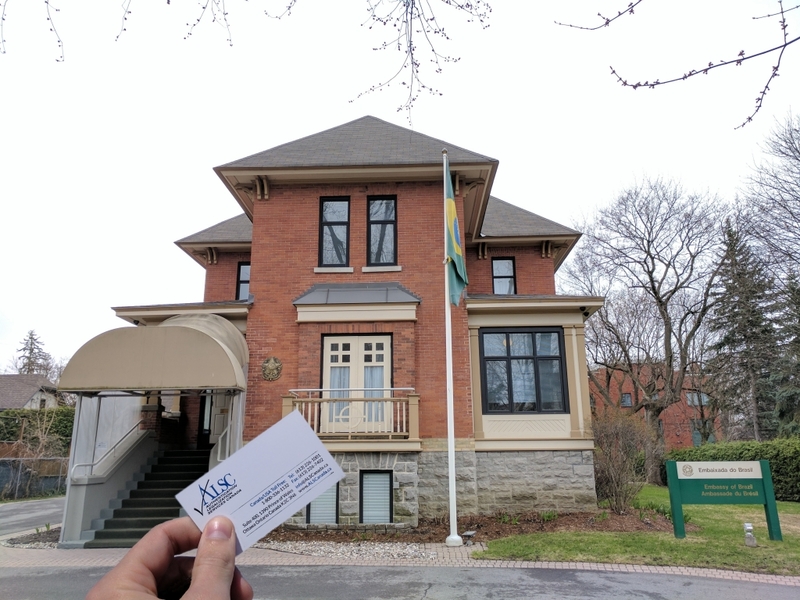 Minutes away from the Brazilian consulate in Ottawa and able to assist you with other Brazilian consulates in Canada, our services to save you time, minimize delays, and ensure your documents will be accepted in Brazil; it’s our service guarantee. Although we cannot influence the processing time for legalization at the Brazilian consulates, we can save you as much as 20 business days off of your authentication processing time at Global Affairs with our priority same business day service. We also offer 3 business day standard and 10 business day economy authentication services which balance affordability with efficiency. Either way, you save processing time. Over two decades of work with the Brazilian consulates in Toronto, Vancouver, Montreal and Ottawa has resulted in a close professional relationship between our staff and theirs allowing us to be up to date on every one of their changing requirements and fees. As noted earlier, not all Brazilian consulates recognize the signature of Global Affairs Canada. 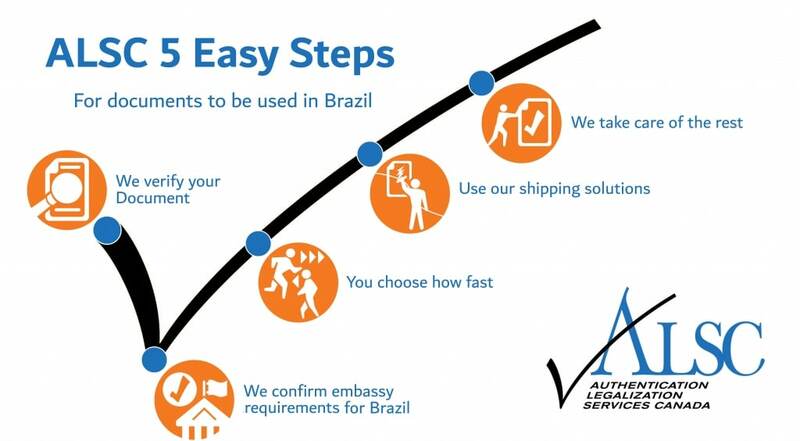 Luckily, we offer an ODS authentication service as well as other provincial authentication such as Alberta Justice authentication if you require this for legalization at the Brazilian consulate. Since each consulate has its own requirements for authentication, we recommend you ask us about your documents. When you use our services, we advise you as to which authentication you require, what you will need for provincial authentication, ODS authentication, or authentication at Global Affairs, and finally legalization at the appropriate Brazilian consulate. Our agents will assist you with preparing your documents and any additional requirements. They will also provide you with detailed updates every step of the way, answering any questions and addressing any concerns that may arise. Upon completion, we can ship your documents anywhere in the world they need to go through one of our many trusted shipping partners. If you have Canadian documents for use in Brazil, we strongly recommend you contact us. We will ensure your Canadian documents are ready for use in Brazil and minimize the delays which frequently occur during the process. Refer to the remainder of the article for more information on various Canadian documents for use in Brazil, how to get them, and how we can help with their authentication and legalization for use in Brazil. Brazil’s diverse marketplace attracts thousands of foreign companies every year. There is no shortage of Canadian businesses which follow suit. Whether to export Canadian products, partner with Brazilian corporations, or modify existing divisions of your company, you will require a series of documents such as Certificate of Pharmaceutical Product, directors resolution, authorization letter, corporate power of attorney, and certificate of incorporation that need to be authenticated and legalized for use in Brazil. As an existing Canadian business, it is likely you have already had to provide many of these documents for various purposes within Canada, and are therefore familiar with how to get them. The exact documents which you will need depends entirely on what your affiliates in Brazil have requested of you. One of the most common causes of delay is poor communication between Canadian businesses and their requesting parties in foreign countries. As such, make sure you always clarify exactly which Canadian corporate documents you will need for use in Brazil. This will save you time and money. Before your Canadian corporate documents can be authenticated at Global Affairs Canada or at the appropriate provincial office, they will need to be notarized by a lawyer or notary public. As you may already know, lawyers can also draft documents such as corporate powers of attorney. There are some cases where processing original Canadian corporate documents for authentication and legalization is not an option and notarized copies will have to be made. This can be because the original corporate document cannot be damaged, altered, or easily replaced. In this case, we strongly recommend you contact us prior to making your notarized copies as each Brazilian consulate has its own specific requirements. If you need to get a commercial invoice or certificate of origin for use in Brazil, you can use the “TradeCert” Certification Made Simple service offered by the Canadian Chamber of Commerce here in Ottawa. Not only can they certify your Canadian commercial invoice and certificate of origin, but their signatures are on file at Global Affairs Canada as well as provincial bodies making them valid for authentication upon issuance. As members of the Canadian Chamber of Commerce, we can pick up your signed commercial invoice and certificate of origin free of charge from their office in downtown Ottawa for processing. We can even process your completed certificate of origin and commercial invoice if you send them to us via email. Many of our clients choose to do this. If you are interested in either of these two options, please let us know when you contact us. Canadian birth certificates, marriage certificates, and death certificates are a few of the commonly requested documents for personal affairs in Brazil. These can be requested of you for purposes relating to citizenship, immigration, marriage, employment, or retirement. Canadian vital statistics documents are issued by the province in which the life event occurred. Luckily, processing Canadian birth certificates, marriage certificates, and death certificates for use in Brazil is easier than most documents. This is because they contain signatures that are recognized by Global Affairs Canada as well as provincial bodies and are therefore ready for authentication in their original state. You may be nervous about using your original birth certificate, marriage certificate, or death certificate for authentication and legalization. There is also a chance you may not have these documents on hand, are having difficulty locating them, or see they have become damaged over time. Thankfully, it is very easy to order a new copy of your Canadian birth certificate, marriage certificate, or death certificate from the appropriate provincial body. If you need to order a Canadian birth certificate, marriage certificate, or death certificate for use in Brazil, refer to the helpful links below. Make sure you order the long form versions where applicable, as Global Affairs cannot do short form birth certificates or any other short form vital statistics document. Many of our clients choose to have their new vital statistics documents shipped directly to our office to save processing time. We recommend you do the same but make sure to let us know first! We often forget that it is a feat to expand your reach into foreign countries, whether for personal or corporate reasons. In the world of authentication and legalization, some countries are easier to process documents for than others. Brazil is doubtless one of these more difficult countries but there is little question that the payoff is worth the effort. Authentication and legalization isn’t easy to navigate on your own. Dozens of our clients come to us after having tried and failed themselves. When you have our team on your side, authentication and legalization of your Canadian documents for use in Brazil is virtually effortless. Our A+ rating with the BBB, our notable membership with the Canadian Chamber of Commerce, and our growing list of 5-star Facebook and Google reviews are proof that we are the best at what we do. This doesn’t stop us from continuously improving ourselves and finding ways to provide an even better and more efficient service to our clients. This is why we opened over a dozen service centers in major cities across Canada with plans to open more. These service centers save you the time of waiting at the post office as well as shipping costs. Once you have called our head office to make an appointment and confirmed your service requirements, you can drop off your documents at any one of our service centers in Surrey, Calgary, Victoria, Vancouver, Edmonton, North York, Mississauga, Halifax, Regina, Winnipeg, Toronto, or Montreal, and receive free priority shipping via FedEx to our head office in Ottawa for processing. Upon completion we can send your completed documents back to the service center where you dropped them off or any other service center in Canada free of charge. We can also ship them anywhere else they need to go through one of our shipping partners at an additional cost. Save yourself the stress, time, and money in the long run. Trust the experts with your Canadian documents for use in Brazil and see just how easy it can all be. Click below to get started!